Hotel Plans Updated – TowersStreet - Your premier Alton Towers guide! Alton Towers have recently submitted an updated planning application for the Alton Towers hotel expansion that were previously submitted to the Staffordshire Moorlands District Council in July. The updated plans focus mainly on the interior of the hotel, with some alterations also being made to the exterior and surrounding area of the expansion. Most notably, the restaurant area has been altered to include a larger salad and snack bar, a minor change in the layout of the seating and a redesign of the buffet area. 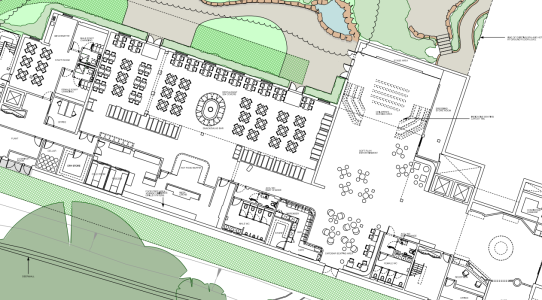 The new plans also incorporate a larger kitchen, boasting two large pizza ovens, possibly indicating the types of food that will be on offer at the new restaurant. In addition to this, there is a large area aimed towards children’s entertainment, including new seating facing the stage that is presumed to be used for entertainment of a night time, a staff changing room and a soft play area near to the stage. This area was previously blank on the original submitted planning documents. This certainly indicates that the hotel will be aimed at families, rather than adults as was once thought. Additional bedrooms are also included on the plans on the ground floor, increasing the total to 76. Externally, the second roundabout has been removed in order to allow for additional parking spaces, and also further landscaping developments will take place, including new fencing layouts for the new external area of the Spa heading towards the sauna. The landscaping also shows a less steep embankment leading to the sunken garden with minor alterations of the paths and design. The Spa extension is also set to receive a redesigned roof incorporating sky lights rather than the dormer window that was originally planned. 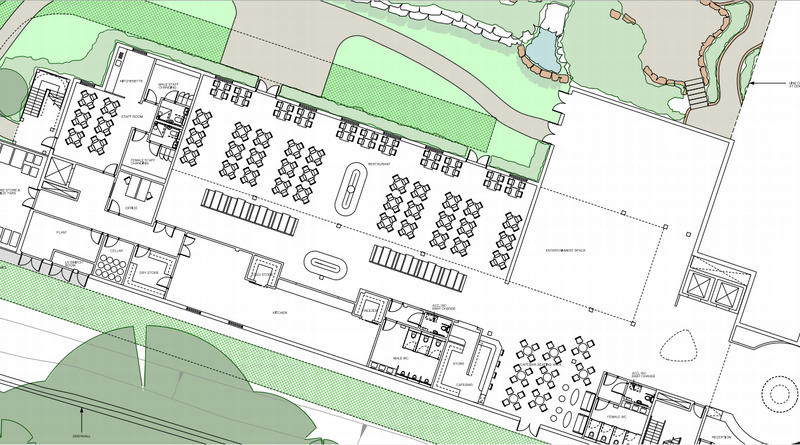 As well as the newly updated plans, some comments have now also been added to the councils planning website; Severn Trent Water, Staffordshire highways agency, Historic England and Alton Parish Council all raise no objection to the new hotel extension. However two local residents have objected to the plans. What do you think think of the updated plans? Discuss this and more over on our Talk Forums.